. . .Sauker Head. Sauker-Head lies 3 Miles to the Eastward of Cape Chapeaurouge, it is a pretty high round Point, off which lie some sunken Rocks, about a Cable's Length from the Shore. Garden Bank This Bank whereon is from 7 to 17 Fathom Water, lies about half a Mile off from Little St. Laurence, with Blue Beach Point on with the East Point of Great St. Laurence. Ferryland Head. Ferryland head lies S.W. 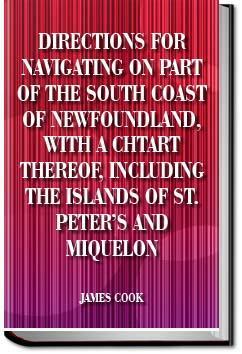 1 Mile from Cape Chapeaurouge, it is a high rocky Island, just seperated from the Main; it and Cape Chapeaurouge are sufficient Marks to know the Harbours of St. Laurence.